Water Jel Technologies - BURN JEL MAX BOTTLE 3 OZ. 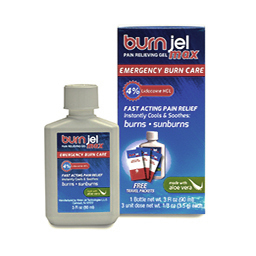 BURN JEL MAX BOTTLE 3 OZ. Burn Jel is the leading emergency treatment for minor burns used by doctors, U.S. Military and EMTs around the world. This thick gel cools and soothes minor burn injuries and sunburns. This product is formulated for burns caused by hot materials, liquids and steam. The 3 oz. bottle contains 4% Lidocaine HCL to relieve pain fast.